When we walk across the stage and graduate from a prestigious place like Yale, it is assumed that we were endowed with the necessary skills to be great leaders in society, including, but not limiting to, essay crafting, calculus and close reading. But there are some skills, unbeknownst to many, that are the true crowning glory of all Yalies. These skills prepare us for the outside world better than any seminar could. Yalies have places to be. Places we should have left earlier to be at, but that’s beside the point. Point is, when I have a meeting at Bass Café at 5pm and I left Farnam at 4:58, I have zero time to waste. In my short time at Yale, I have learned how to dodge oncoming traffic (what are crosswalks anyway?) and dodge oncoming conversation (look down at adjust your gloves, works every time). I know exactly how much time I have to pass someone on a two-lane sidewalk before obstructing the walking path of oncoming walkers. If person A is walking pretty fast towards you, and person B is walking like they’ve never walked in front of you, how many seconds do you have to pass person B before person A gives you the evil eye for making them walk in the snow bank? This is the kind of math we need to be teaching people. For some reason no one wants to take out the trash. This simple task seems to be the kryptonite for every under thirty year old on the planet. Starting a ten page-paper mere hours before it’s due? No problem. But when you ask someone to walk down three flights of steps with a half-pound bag of candy wrappers and apple cores they look like you just asked them to run from Morse to Kline Biology Tower. 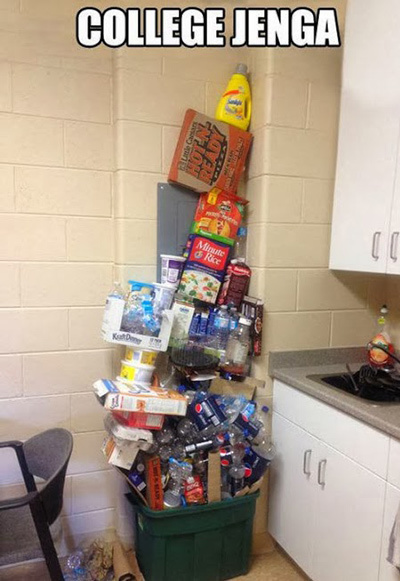 As a result, the trashcan in your common room looks like Jenga? It’s a much more annoying version of the game we all love: whoever knocks the whole thing over has to take the trash out. You know who wins in this game? No one. Whether it’s over email or over text (GroupMe or otherwise), college teaches you to throw shade at anyone and everyone. For those of you not well versed in the hot new slang of the youths, throwing shade, as defined by the highest thumbed-up Urban Dictionary post, is “to talk trash about a friend or acquaintance, to publicly denounce or disrespect.” Throwing shade is petty, we all know it, but we do it anyway. You don’t want to come off as a bad person, but when your mind comes up with a beautifully clever comment that’s that you know will slice through the heart of your intended target, you just have to do it. Not to be confused with throwing shade, passive aggression is a skill in itself. Where shade seeks to put down (I would say see the phrase “sneak diss” if my articles has appendixes), the goal of passive aggression is “hostility” towards someone who “fails to accomplish requested tasks for which one is (often explicitly) responsible” #Wikipedia. Person B: Yea sure, where should I put your three coats and shoes? In the closet or just on the carpet where you usually put them? PB: No problem! Do you want me to clean the bathroom too? Maybe scrub the shower down? PA: Nope, no worries, I already cleaned the bathroom for the past two weekends, I’m sure it’s still pretty clean. If you can’t walk up Science Hill, while drinking Blue State, while making plans for Friday and Saturday night in a group text, while simultaneously maintaining a somewhat fruitful conversation with an acquaintance, you’re not Yale-ing correctly. I don’t remember the last time I was awake and only doing one thing. I mean, even as I write this article I’m talking to a few of my suitemates. We only live, what like, ninety years, if you’re lucky? Minus the time we spend sleeping and minus the time some of you can’t remember because you were drunk (~shade~), that leaves you with way-too-little time. How am I going to write the next Fifty Shades of Grey at that rate? Exactly, it’s impossible.